I was reading through the comments on my YouTube channel and one dessert I saw requested time and time again was Beignets. It’s a yeasted doughy treat coated in powdered sugar and fried. However mine have a Big & Bold twist since they are baked, not fried. Beignets are very popular in Creole cuisine. A lot of us know Beignets because of the the famous Cafe Du Monde restaurant in new Orleans where people flock from all over the world to try the famous sweet dough. I have not been (yet) to Cafe Du Monde. But I have been to Disneyland where I have enjoyed my fair share of Mickey Mouse-shaped Beignets. They also made an appearance in Disney’s Princess and the Frog where Tiana served them at the diner. Just because I don’t fry my Beignets, that doesn’t mean they aren’t delicious. However I want to give them a little extra something something before serving so I brush them generously with butter and sift over powdered sugar. If you like the idea of popular desserts that are baked instead of fried then check out my Baked Churros and Baked Donuts recipes. Beignets are a yeasted dough, similar to donuts. You can easily mix the dough by hand, no machine needed. You can make this Beignet dough in advance and store it in the fridge for up to 2 days. They still have a lot of flavor but without the frying. Serve them fresh out of the oven coated in icing sugar. Mix water, sugar, and yeast in a large bowl and let sit 5-10 minutes. In a medium bowl, whisk the eggs, salt, vanilla extract and evaporated milk together. Add egg mixture to yeast mixture and mix. Stir in the melted butter, followed by the bread flour. Using a spatula or your hand bring the dough together into a ball (I like to use my hand so you can feel whats going on). You will notice that this dough will be a little sticky, that's ok. Coat a large bowl with oil, place dough in bowl and cover with plastic wrap. Let rise at least 2 hours or place in refrigerator overnight. Place the squares on a baking sheet lined with parchment paper 1 inch apart and let the dough proof for about 45 minutes. Brush each square lightly with milk and bake for 12-15 minutes, or until golden brown. 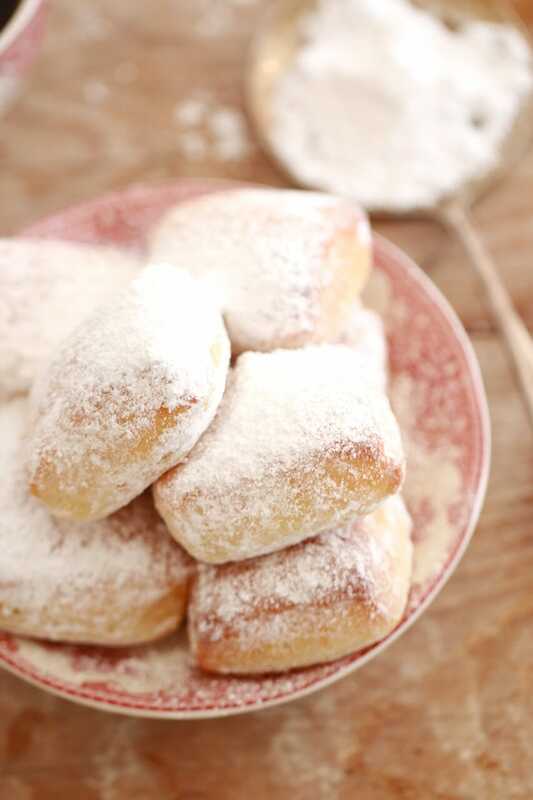 While the beignets are still warm, brush them with butter and generously dust with icing sugar. Can/has anyone filled these with a hazelnut cream or jam? Great question! That sounds like it would be delicious. Hey Gemma! How would you go about making this recipe dairy-free? Hi, you can use coconut evaporated milk and vegan butter or coconut oil. Enjoy! Can you freeze some after baked. Alone won’t be able to eat them all. OMG! I just made this recipe with a few modifications. It turned out awesome. Thank you for sharing. I made the dough in my breadmaker using the timer so I woke up with it ready to bake. My only change to the dough recipe was to add 1 tsp of cinnamon, 1/2 tsp of nutmeg, & 1/2 tsp of cardamom to the flour mixture for a subtle spice flavour. I baked then till golden and cooled them. Instead of powdered sugar I made a maple glaze and served them while slightly warm. It is more of a doughnut I guess but definitely a repeat recipe. Haha! you are a baking genius. I have to try this now, I love the idea of the spice, and cardamom is a fabulous addition to your spice mix,not to mention the maple glaze, well done you. I hope other bold bakers, particularly those with bread machines lurking in their cupboards, will take notice of this. How do I make maple glaze? I was wondering, is it possible to make these with a gluten free flour blend? As you will know yeast baking depends on gluten. Gluten free blends sometimes have xanthan gum, or guar gum added in order to mimic the action of yeast. This suggests that you can make this type of recipe, however it will be a different result, but worth a shot, with a sample recipe. I would say 1/2 the recipe, then add the liquids cautiously, the flour will take the liquids in a different way to wheat flour. Yes, yeast baking is a process, the proofing time must be accounted for. I hope you try this recipe, it is worth it! Can I still fry the beignets using the same measurements? Joy from Nigeria. Hi, yes you can, enjoy! Can the batch be doubled w/o compromising the dough?? i am from India and its not easy to find bread flour in this part of the world. so is it possible to substitute it with all purpose flour ? Yes! I have been there, very yummy indeed. I use to make these in a Michelin restaurant in San Francisco, very popular they were too. Back to Cafe du Monde for me so, you are making it sound so appealing. This is really a southern thing, cajun food, brought by the French settlers way back then. I think an American fusion food, if you will. It is no wonder it is high on the list for people traveling to Louisiana. Hi Gemma. Sorry i wanna ask again. Every time i bake the beignets, they are never golden brown in color. I always brush the tops with milk l, i also bake them at 180c for 15mins but they always come out white. The texture and taste are always good, though even though they are white. . I tried to bake them for 5-10mins longer but still they never browned like yours, just a little bit brown on the edges of the beignets placed on the corners. Im afraid if i bake them longer they will dry out. Is it ok or did i do something wrong? How hard the outer of the beignets should be? I am not too sure what the issue is. These should bake more or less evenly. I am wondering about your oven, the type of oven, and the control you have over the temperature. I think you could turn up your oven a touch, it may be running a bit cool. If it is an OTG then there may be other issues. Try raising the temperature, even 10C/20F will make a difference. Hi Gemma! I would love to make this recipe for a party, how many beignets does this recipe make? I couldn’t quite figure it out. Sorry if this is a silly question, I’m new to baking and am unfamiliar with some of the terms. Thanks! Depending on how big you make them you should get 12 good sized beignet out of this dough. dough can be stored in the fridge, and it will continue to ferment/rise. You can leave it for a few days, but the flavor of the dough will change, like a sourdough. You could make it, proof it, shape it and freeze it. Then you defrost and proof before baking. You can make fully and bake, then freeze, and this is often the best way of all. Try it, experiment with it. Dough is always at its best when made, proofed and baked withing a day or so.